Kerän [host]: Every once in a while, a brand new book appears on my desk, and I’m always keen to break open the envelope and see what a Manitoba author has produced this time. A few days ago, one arrived from Winnipeger Diane Driedger. It’s a compilation of stories from Canadian women. But these women, including Diane, share something in common. They each have a physical or an intellectual disability. 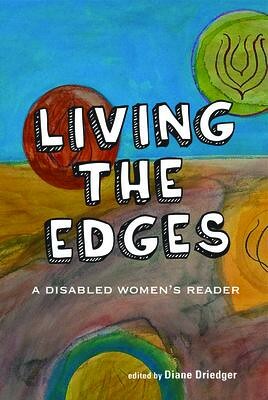 The book is called “Living the Edges: A Disabled Women’s Reader”, and in it women write about what it’s like to be different in a world that seems to prefer nothing but normal. Diane Driedger’s on the line now: hi there! Kerän: Well, for those of us who haven’t had a chance to read the entire book, what would you say it’s about? What would you say is in it? Diane: Well, there are essays, and poems, and art from over forty women from East to West to North here in Canada, and it’s about the barriers that women with disabilities come up against in their daily lives. And most of these are imposed by society. Things like attitudes, that people don’t understand that perhaps you have limitations, especially if you’re a person who has invisible disabilities like myself: people often look at you and say “But you look so good! What do you mean, you need accommodations?” You know? Diane: That’s fine! Yes, I have fibromyalgia, and I’ve had that for eighteen years. And I also have asthma, and I’m a breast cancer survivor, almost five years now. And what a lot of people don’t know is that breast cancer treatment in itself is also disabling to people in different ways. Chemotherapy and radiation is a big assault on the body. But all of these things mean that I have fatigue and chronic pain problems, and of course winter is really the worst time. And so living in Winnipeg you can imagine the barriers that are imposed within the environment here. Kerän: And if was interesting that I called and said “Are you able to come down?”, and you said “Is it really necessary?” and I said “No, no it’s not necessary to come down, you stay at home” because I think it is hard for you, it is hard for you to get around in the wintertime. Diane: Yeah. The body is feeling pretty creaky this morning. Kerän: What do you think have been the most difficult barriers that you’ve experienced? Diane: I would say, ah, there are a lot of barriers around employment issues. For people with disabilities in general, and for many of us women with disabilities who have invisible conditions it’s very difficult to talk with employers about accommodations and to receive them. Often people are wondering if you’re making up the story because you don’t wanna do work in a certain way. And for me, a barrier is, you know, I cannot sit at a desk nine to five any longer. Just because sitting is my worst position. My best positions are lying down and standing up. And because I do an administrative job, that becomes an issue. But my current employer has made accommodations for me where I work at home in the morning, and a lot of that work takes place with me lying down on the couch, talking on the phone, I write lying down, I read lying down, and in the afternoons I go to the office and talk with my staff and have meetings. Kerän: And you’re the provincial coordinator for the Manitoba League for Persons with Disabilities, so they understand? Kerän: Listen, you’ve had some interesting experiences when you applied for jobs. And I found, when you were telling me about them, I found they were quite astounding. What happened to you? Kerän: So it was YOUR fault, that you caused the problem for her? Kerän: And you focus on women in this book I think because – is it true that women, more women than men suffer from invisible disabilities? Diane: Definitely true. There are a lot of these, what they call these “new disabilities”, right? Chronic fatigue syndrome, fibromyalgia, and then long-standing disabilities like lupus, depression (women tend to have higher rates of depression than men), those are just a few examples of conditions that are invisible but can be very disabling. Kerän: Diane, over the years we have seen some changes, physical ones anyway, you know, we’ve made buildings and sidewalks more accessible. What – What do you want to see happen right now to change the attitudes toward invisible disabilities? Diane: Well, I would like employers to understand that work can take place in any format, and work goals can be achieved often in different ways that we’re not used to, but we need to adopt a flexible attitude toward work: where it takes place, how it takes place. Particularly in this computer age, there should be no reason why we can’t have many more home-based employees who may not be able to get out as much. That’s my message: let’s think outside the box when it comes to work and how we work. Kerän: Good thoughts to think about. Thank you so much! Kerän: Diane Driedger’s one of the editors of “Living the Edges”. which is a disabled women’s reader. She’s also the provincial co-ordinator for the Manitoba League for Persons with Disabilities. And I’d like to hear from you on the subject. Are you someone with an invisible disability, or as Diane puts it someone with Double Jeopardy of being woman and disabled? What are your thoughts on this? Why are we not makign progress? Why are we still blind to the fact that the world doesn’t have to be full of “normal” people? That there is lots of room, and that room should be made for everybody no matter what the differences are? You can call our listener line 788 3102 or email us weekend@cbc.ca . The book is $30 direct from the publisher (I think they’re Canadian dollars), $30 USD from Amazon, or $57 AUD from Emporium Books Australia. And if you’d like your local academic or public library to stock it, how about putting in a request to the librarian? I’ve not heard it used to refer to people with mental health conditions, but I admit I’ve been very quiet about who I talk to.